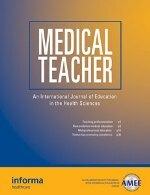 Our empirical paper describing a qualitative study of recently qualified doctors and their apparent lack of interest in geriatric medicine is being published in Medical Teacher. The journal has a 2013 impact factor of 2.045 and a 5-Year impact factor of 2.170. The paper can be cited as: Samra, R., Griffiths, A., and Cox, T. (In Press) Exploring the lack of interest in geriatric medicine. Medical Teacher. doi: 10.3109/0142159X.2014.970995. The pre publication version is available online at: http://informahealthcare.com/doi/abs/10.3109/0142159X.2014.970995?journalCode=mte. Our thank to Raj Samra for persevering with this paper and seeing it through to publication. This entry was posted in Uncategorized and tagged Amanda Griffiths, Geriatric medicine, Junior doctors, Qualitatve study, Raj Samra. Bookmark the permalink.